Welcome back, Ashes players! Last week we introduced the two newest Phoenixborn to join the fray; Koji and Astrea! Today, we will explore some of the new tactics Koji has to swing the battle in his favor. We know that Natural magic is home to some big, tough units, and that Sympathy magic rewards players who use their resources in the most synergistic manner. Today’s preview will help to show the connection between these magic types and help show how they can best work together. The Hunt Master is the latest addition to the group of Allies that cost 1 power, 1 class, and 1 basic. 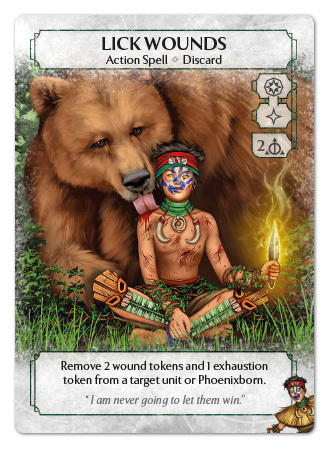 2 Attack is on the low side for an Ally of this type, but the 3 Life and Recover of 1 will help it to stick around to get multiple uses out of the most intriguing part of this card; the Call the Hunt ability. 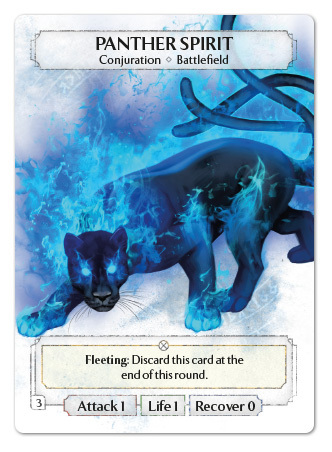 This ability allows for a 1/1/0 Panther Spirit conjuration to enter the battle right as you are ready to attack! This can be a significant advantage for pushing aggressive strategies, as your opponent will have no opportunity to ping down the Panther Spirit before it can get its attack in! Being able to suddenly increase the number of units you have out when attacking can present an offensive pressure that gets damage through to the opposing Phoenixborn quickly. Alternatively, the Panther Spirit can play defense, providing you with a blocker following your attack, should you choose not to send it in to battle. Koji’s 10 Battlefield has plenty of room for Panther Spirits, too, so you should have no problems with bringing Hunt Masters and their companions along for the fight. 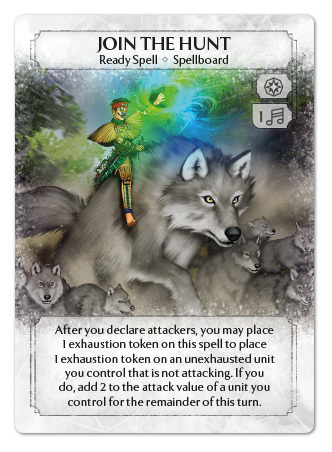 We saw in last week’s preview how many units Koji can summon with the Summon Indiglow Creeper Ready Spell. Here we have a utility Ready Spell that can help take advantage of the overwhelming number of units on Koji’s battlefield. Join the Hunt can help add to your offensive pressure without needing to risk having your units fall in battle. By opting to exhaust an extra Luminous Seedling or a Panther Spirit who was left behind, you can add 2 attack value to your other attacking units like Hunt Master or the Brilliant Thorns! Join the Hunt has an additional benefit of making opponents think twice about clogging your battlefield. Regressed units are perfect candidates for exhausting to add 2 attack elsewhere, and Blood Puppets make great attackers when boosted up to 2 attack! Both the Salamander Monk and its Spirit form can be great in-class conjurations that work well in either role, serving as a cheap body to exhaust, or a surprisingly powerful 3 attack. Join the Hunt has a very cheap play cost, so it is easy to include in decks with even just a splash of Sympathy. This is one of my favorite cards in the game and I hope you all enjoy it just as much! I know we changed things up last week by not showing off Koji’s unique card, but here it is now! For two and a parallel cost of a Main OR Side action, Koji can save a unit on the brink of destruction and turn it back into a fighter ready for battle again! Surprise your opponents with a side action unexhaust followed immediately by a threatening attack action! Players will always have to tiptoe around Koji’s battlefield, knowing that, at a moment’s notice, they could be struck with an attack they may not be prepared for. 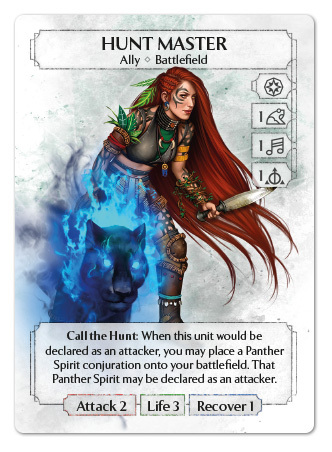 The Hunt Master we saw today can be unexhausted to put out yet another Panther Spirit, or you might simply want to get another attack in with a Brilliant Thorn before the Fade away. But this is not all Lick Wounds can do! You can use Lick Wounds to heal and unexhaust Koji himself, giving you another free status token placement of your choice. This can be an essential tactic for growing Koji’s Luminous Seedlings, and Koji’s Accelerate Growth ability being free to use is a great reason to use Lick Wounds. On top of that, having some Phoenxiborn healing is always welcome since Koji only has 16 Life. You may even look to gain even more life by using your Accelerate Growth ability on Chant of Protection! Whatever your choice is, Lick Wounds is a solid option with many applications, whether you need to ready some more attackers, get a blocker at a moment’s notice, or for when you just need to buy a little more time with some quick Phoenixborn healing. That’s all for today! Be sure to check out last week’s Organized Play Kit announcement for more Ashes goodness, and stay tuned for our next preview on Thursday as we see what units Astrea will be bringing to battle.